TLDR: If you see devices like "xwayland-pointer" show up in your xinput list output, then you are running under a Wayland compositor and debugging/configuration with xinput will not work. 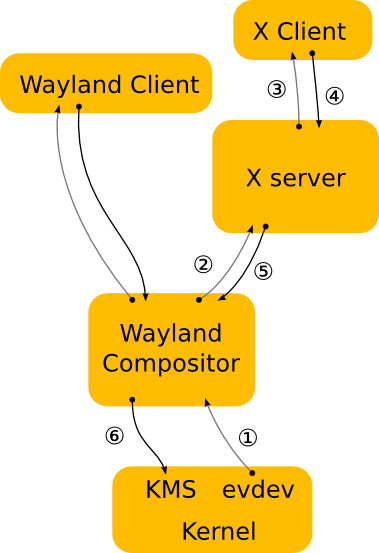 In the above graphic, devices are known to the Wayland compositor (1), but not to the X server. The Wayland protocol doesn't expose physical devices, it merely provides a 'pointer' device, a 'keyboard' device and, where available, a touch and tablet tool/pad devices (2). XWayland wraps these into virtual devices and provides them via the X protocol (3), but they don't represent the physical devices. This usually doesn't matter, but when it comes to debugging or configuring devices with xinput we run into a few issues. First, configuration via xinput usually means changing driver-specific properties but in the XWayland case there is no driver involved - it's all handled by libinput inside the compositor. Second, debugging via xinput only shows what the wayland protocol sends to XWayland and what XWayland then passes on to the client. For low-level issues with devices, this is all but useless. The takeaway here is that if you see devices like "xwayland-pointer" show up in your xinput list output, then you are running under a Wayland compositor and debugging with xinput will not work. If you're trying to configure a device, use the compositor's configuration system (e.g. gsettings). If you are debugging a device, use libinput-debug-events. Or compare the behaviour between the Wayland session and the X session to narrow down where the failure point is. This is a higher-level explanation of the inputfd protocol RFC I sent to the list on March 31. Note that this is a first draft, this protocol may never see the light of the day or may be significantly altered before it lands. First, what is it? inputfd is a protocol for a Wayland compositor to pass a file descriptor (fd) for an input device directly to the client. The client can then read events off this fd and process them, without any additional buffering in between. In the ideal case, the compositor doesn't care (or even notice) that events are flowing between the kernel and the client. Because the compositor sets up the fd, the client does not need any special privileges. 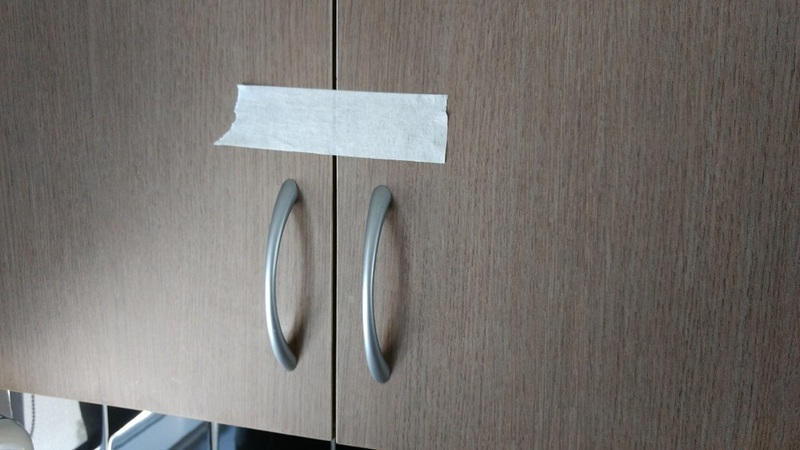 Why is this needed? There are a few input devices that will not be handled by libinput. libinput is the stack for those devices that have a direct interaction with the desktop - mice, keyboards, touchpads, ... But plenty of devices do not want or require desktop interactions. Joysticks/gamepads are the prime example here, but 3D mice or VR input devices also come to mind. These devices don't control the cursor on the desktop, so the compositor doesn't care about the device's events. Note that the current draft only caters for joysticks, 3D mice etc. are TBD. Why not handle these devices in libinput? Joysticks in particular are so varied that a library like libinput would have to increase the API surface area massively to cater for every possibility. And in the end it is likely that libinput would merely buffer events and pass them on almost as-is anyway. From a maintenance POV - I don't want to deal with that. And from a technical POV - there's little point to have libinput in between anyway. Furthermore, it's already the case that gaming devices are opened directly by the application rather than going through X. So just connecting the clients with the device directly has a advantages. What does the compositor do? The compositor has two jobs: device filtering and focus management. In the current draft, a client can say "give me all gaming devices" but it's the compositor that decides which device is classified as such (see below for details). Depending on seat assignment or other policies, a client may only see a fraction of the devices currently connected. Focus management is relatively trivial: the compositor decides that a client has focus now (e.g. by clicking into the window) and hands that client an fd. On focus out (e.g. alt-tab) the fd is revoked and the client cannot read any more events. Rinse, wash, repeat as the focus changes. Note that the protocol does not define how the focus is decided, that task is up to the compositor. Having focus management in the compositor gives us a simple benefit: the client can't hog the device or read events when it's out of focus. This makes it easy to have multiple clients running that need access to the same device without messing up state in a backgrounded client. The security benefit is minimal, few people enter their password with a joystick. But it's still a warm fuzzy feeling to know that a client cannot read events when it's not supposed to. What devices are applicable devices? This is one of the TBD of the protocol. The compositor needs to know whether a device is a gaming device or not, but the default udev tag ID_INPUT_JOYSTICK is too crude and provides false positives (e.g. some Wacom tablets have that tag set). The conversion currently goes towards having a database that can define this better, but this point is far from decided on. There are a couple of other points that are still being discussed. If you have knowledge in game (framework) development, do join the discussion, we need input. Personally I am far from a game developer, so I cannot fathom all the weird corner cases we may have to deal with here. Flying blind while designing a protocol is fun, but not so much when you then have to maintain it for the next 10 years. So some navigational input would be helpful. libinput has a couple of features that 'automagically' work on touchpads such as disable-while-typing and the lid switch triggered disabling of touchpads and disabling the touchpad when an external mouse is plugged in . But not all of these features make sense on all touchpads. For example, an Apple Magic Trackpad doesn't need disable-while-typing because unless you have a creative arrangement of input devices , the touchpad won't be where your palm is likely to hit it. Likewise, a Logitech T650 connected over a unifying receiver shouldn't get disabled when the laptop lid closes. For this to work, libinput has some code to figure out whether a touchpad is internal or external. Initially we had some code to detect this but eventually moved this to the ID_INPUT_TOUCHPAD_INTEGRATION property now set by udev's hwdb (systemd 231 and later). Having it in the hwdb makes it quite trivial to override locally where the current rules are insufficient (and until the hwdb is fixed, thanks for filing a bug). We still have the fallback code though in case the tag is missing. On a sufficiently modern distribution, udevadm info /sys/class/input/event4 for your touchpad device node should show something like ID_INPUT_TOUCHPAD_INTEGRATION=internal. So for any feature that libinput adds for touchpads, we only enable it where it makes sense. That's why your external touchpad doesn't trigger disable-while-typing or the lid switch. ok, I admit, this is something we should've left to the client, but now we have the feature. yes, I'm sure there's at least one person out there that uses the touchpad upside down in front of the keyboard and is now angry that libinput doesn't allow arbitrary rotation of the device combined with configurable dwt. I think of you every night I cry myself to sleep. First, what are switches and how are they different so keys? A key's state is transient with a neutral state of "key is up". The state itself is expected to change frequently. Switches don't always have a defined logical neutral state and the state changes only infrequently. This requires different handling in applications and thus libinput exposes a new interface (and capability) for switches. The interface itself is trivial. A switch event has two properties, the switch type (e.g. "lid") and the switch state (on/off). See the libinput-debug-events source code for a simple code to print the state and type. In libinput, we generally try to restrict ourselves to the cases we know how to handle. So in the first iteration, we'll support a single switch event: the lid switch. This is the toggle that changes when you close the lid on your laptop. Lid switches on some devices are unreliable. There are some devices where the lid is permanently closed and other devices where the lid can be closed, but we'll never see the open event. So we change behaviour based on a few factors. After all, no-one likes a dysfunctional touchpad because the lid switch is broken (if you do, seek help). For one, whenever we detect keyboard events while in logically closed state we'll assume that the lid is open after all and adjust state accordingly. Unless the lid switch is reliable, we don't sync the initial state. That's annoying for those who start libinput in closed mode, but it filters out all devices that set the lid switch to "on" and then never change again. On the Surface 3 devices we go even further: we know those devices needs a bit of hand-holding. So whenever we detect activity on the keyboard, we also write the EV_SW/SW_LID state to the device node, thus updating the kernel to be correct again (and thus help everyone else who may be listening). The exact behaviours will likely change slightly over time as we have to deal with corner-cases one-by-one. But meanwhile, it's even easier for compositors to listen to switch events and users don't have to deal with ghost touches anymore. Many thanks to James Ye for implementing this. In order to read events and modify devices, libinput needs a file descriptor to the /dev/input/event node. But those files are only accessible by the root user. If libinput were to open these directly, we would force any process that uses libinput to have sufficient privileges to open those files. But these days everyone tries to reduce a processes privileges wherever possible, so libinput simply delegates opening and closing the file descriptors to the caller. The functions to create a libinput context take a parameter of type struct libinput_interface. This is an non-opaque struct with two function pointers: "open_restricted" and "close_restricted". Whenever libinput needs to open or close a file, it calls the respective function. For open_restricted() libinput expects the caller to return an fd with the given flags. In the simplest case, a caller can merely call open() and close(). This is what the debugging tools do (and the test suite). But obviously this means you have to run those as root. The main wayland compositors (weston, mutter, kwin, ...) instead forward the request to systemd-logind. That then opens the event node and returns the fd which is passed to libinput. And voila, the compositors don't need to run as root, libinput doesn't have to know how the fd is opened and everybody wins. Plus, logind will mute the fd on VT-switch, so we can't leak keyboard events. In the X.org case it's a combination of the two. When the server runs with systemd-logind enabled, it will open the fd before the driver initialises the device. During the init stage, libinput asks the xf86-input-libinput driver to open the device node. The driver forwards the request to the server which simply returns the already-open fd. When the server runs without systemd-logind, the server opens the file normally with a standard open() call. So in summary: you can easily run libinput without systemd-logind but you'll have to figure out how to get the required privileges to open device nodes. For anything more than a test or debugging program, I recommend using systemd-logind. We're in the middle of the 1.7 development cycle and one of the features merged already is support for "wheel tilt", i.e. support for devices that don't have a separate horizontal wheel but instead rely on a tilt motion for horizontal event. Now, the way this is handled in the kernel is that the events are sent via REL_WHEEL (or REL_DIAL) so we don't actually need special code in libinput to handle tilt. But libinput tries to to make sense of input devices so the upper layers have a reliable base to build on - and that's why we need tilt-wheels to be handled. For 'pointer axis' events (i.e. scroll events) libinput provides scroll sources. These specify how the scroll event was generated, allowing a caller to handle things accordingly. A finger-based scroll for example can trigger kinetic scrolling while a mouse wheel would not usually do so. The value for a pointer axis is also dependent on the scroll source - for continuous/finger based scrolling the value is in pixels. For a mouse wheel, the value is in degrees. This obviously doesn't work for a tilt event because degrees don't make sense in this context. So the new axis source is just that, an indicator that the event was caused by a wheel tilt rather than a rotation. Its value matches the default wheel rotation (i.e. 15 degrees) just to make use of it easier. Of course, a device won't tell us whether it provides a proper wheel or just tilt. So we need a hwdb property and I've added that to systemd's repo. To make this work, set the MOUSE_WHEEL_TILT_HORIZONTAL and/or MOUSE_WHEEL_TILT_VERTICAL property on your hardware and you're off. Yay. Patches for the wayland protocol have been merged as well, so this is/will be available to wayland clients. This post describes the synclient tool, part of the xf86-input-synaptics package. It does not describe the various options, that's what the synclient(1) and synaptics(4) man pages are for. This post describes what synclient is, where it came from and how it works on a high level. Think of it as a anti-bus-factor post. The most important thing first: synclient is part of the synaptics X.Org driver which is in maintenance mode, and superseded by libinput and the xf86-input-libinput driver. In general, you should not be using synaptics anymore anyway, switch to libinput instead (and report bugs where the behaviour is not correct). It is unlikely that significant additional features will be added to synclient or synaptics and bugfixes are rare too. The commandline interface is effectively a mapping of the various xorg.conf options. As said above, look at the synaptics(4) man page for details to each option. A decade ago, the X server had no capabilities to change driver settings at runtime. Changing a device's configuration required rewriting an xorg.conf file and restarting the server. To avoid this, the synaptics X.Org touchpad driver exposed a shared memory (SHM) segment. Anyone with knowledge of the memory layout (an internal struct) and permission to write to that segment could change driver options at runtime. This is how synclient came to be, it was the tool that knew that memory layout. A synclient command would thus set the correct bits in the SHM segment and the driver would use the newly updated options. For obvious reasons, synclient and synaptics had to be the same version to work. Atoms are 32-bit unsigned integers and created for each property name at runtime. They represent a unique string (the property name) and can be created by applications too. Property name to Atom mappings are global. Once any driver initialises a property by its name (e.g. "Synaptics Tap Actions"), that property and the corresponding Atom will exist globally until the server resets. Atoms unknown to a driver are simply ignored. 8 or so years ago, the X server got support for input device properties, a generic key/value store attached to each input device. The keys are the properties, identified by an "Atom" (see box on the side). The values are driver-specific. All drivers make use of this now, being able to change a property at runtime is the result of changing a property that the driver knows of. synclient was converted to use properties instead of the SHM segment and eventually the SHM support was removed from both synclient and the driver itself. The backend to synclient is thus identical to the one used by the xinput tool or tools used by other drivers (e.g. the xsetwacom tool). synclient's killer feature was that it was the only tool that knew how to configure the driver, these days it's merely a commandline argument to property mapping tool. xinput, GNOME, KDE, they all do the same thing in the backend. Both set the same property with the same calls. synclient uses XI 1.x's XChangeDeviceProperty() and xinput uses XI 2.x's XIChangeProperty() if available but that doesn't really matter. They both fetch the property, overwrite the respective value and send it back to the server. synclient is a simple tool. If multiple touchpads are present it will simply pick the first one. This is a common issue for users with a i2c touchpad and will be even more common once the RMI4/SMBus support is in a released kernel. In both cases, the kernel creates the i2c/SMBus device and an additional PS/2 touchpad device that never sends events. So if synclient picks that device, all the settings are changed on a device that doesn't actually send events. This depends on the order the devices were added to the X server and can vary between reboots. You can work around that by disabling or ignoring the PS/2 device. synclient is a one-shot tool, it does not monitor devices. If a device is added at runtime, the user must run the command to change settings. If a device is disabled and re-enabled (VT-switch, suspend/resume, ...), the user must run synclient to change settings. This is a major reason we recommend against using synclient, the desktop environment should take care of this. synclient will also conflict with the desktop environment in that it isn't aware when something else changes things. If synclient runs before the DE's init scripts (e.g. through xinitrc), its settings may be overwritten by the DE. If it runs later, it overwrites the DE's settings. synclient exclusively supports synaptics driver properties. It cannot change any other driver's properties and it cannot change the properties created by the X server on each device. That's another reason we recommend against it, because you have to mix multiple tools to configure all devices instead of using e.g. the xinput tool for all property changes. Or, as above, letting the desktop environment take care of it. The interface of synclient is IMO not significantly more obvious than setting the input properties directly. One has to look up what TapButton1 does anyway, so looking up how to set the property with the more generic xinput is the same amount of effort. A wrong value won't give the user anything more useful than the equivalent of a "this didn't work".